Thank you for taking the time to find out important information about your business that you probably were unaware of. The importance of knowing where your company is lacking in consistency, information, public image, and etc, are crucial components in today’s online world. We never know how it’s going to impact us, but we have seen the impact of the Internet and how it can substantially affect businesses today, be it NEGATIVELY or POSTIVELY. 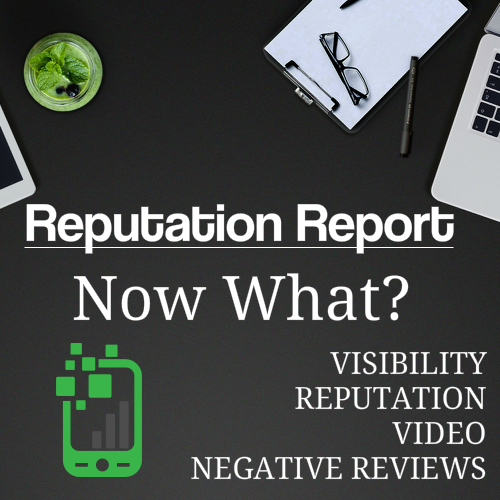 Here at Greenlight I.M.M., we want to make sure you fully understand what this report is displaying to you and let you know what your options are. Our core belief is having a strong foundation built around Google is what drives businesses today. So any information that’s lacking or inconsistent can affect how Google showcases your business to potential searchers. This section of the report is showing you, based on the information you put or the information Google automatically put in for you, where you are listed on and if that information is consistent. The more places people are able to find your business, the more opportunities you have to make an impression, get a review, or get someone to contact you. If someone is looking on Yelp for your business, but you’re only listed on Google, that searcher isn’t going to care that you’re on Google, because at the moment they are on Yelp. So that could turn into a missed opportunity. Google gathers information about your business, they “crawl” the internet looking for all the information about you it can so that it can understand your business and how or who to show your company to in Search Results. If Google finds inconsistent information about you, then you’re less likely to be shown at all. In Google terms, they don’t trust you’re a “real” business. So these factors all play a role in your Visibility, and Greenlight I.M.M. can help gain more visibility by making sure you’re listed correctly on these various sites and optimizing each one for greater impact in search results. This section shows you what review sites you’re found on, how many reviews are located on each one, and the average star rating on each platform. Reputation matters, this is a fact. How you appear to people can put more money into your business or take away money from your business. Reviews are a huge driving force in today’s world. The more 5 star reviews you have, the more attention a searcher will pay to you, plain and simple. If your business is outranking your competition, but they have more 5 star reviews than you do, odds are they will get looked at BEFORE you! Today’s online searcher wants to read what people are saying about you, they want to see feedback, not only from people who have done business with you but also with how you respond to those reviews, whether they are good reviews or bad. Here at GREENLIGHT I.M.M. we have created a 3-part process around creating and growing your reputation. It’s BUILD, MANAGE, and MARKET your reviews. To build, we look at the different places your business can be found where reviews can be left and look at ways to drive your customers to them to generate 5-star reviews. You’ll find most businesses just focus on Google or Facebook, failing to realize the other websites you can gain customers from. Next, we Manage your reviews, making sure you’re aware of all the reviews coming in, where they are located, if they’re good or bad, and help you to respond to them in a timely manner. Lastly, we actively Market your reviews across social media channels to put them the positive message out there for all to see and encourage people to find out why so many good things are being said about you. This section showcases what video can be found on your Website, Youtube, and inside Google Search results. Video has grown to become the #1 way for customers to take action with a business. There are as so many messages that can be shown using a video, you can literally have a video with just a music and text, and that produces results. Video has higher retention rates, searchers are much more likely to click on a video about your business than to look at an image or read an article. So utilizing video in your business and marketing is crucial and efficient. GREENLIGHT I.M.M. takes advantage of this opportunity through creating videos about your business, highlighting the company itself or other features associated. Here are Greenlight IMM, we have several implementations to address all the factors presented in your Online Reputation Report. Our goal is to use this information to make your online presence stronger which in turn leads to more activity/sales/phone calls, you name it. The foundation starts with Google, and branches out from there. Contact us today.